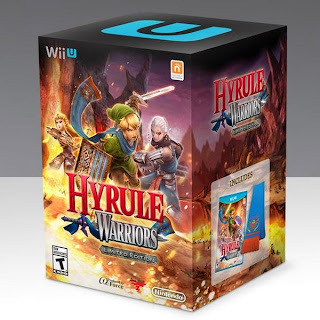 Hyrule Warriors for Wii U comes out September 26th 2014. If you happen to be in New York City that day, go to the Nintendo World Store to make your purchase. The Nintendo World Store is the only place selling the Limited Edition version. The Mario Kart 8 Limited Edition was also a Nintendo World Store exclusive. It sells for $300 brand new. 5x's the original price! Call me crazy, but that $115 for Mario kart 8 limited price is wrong, it's for the pal version. In fact the recently sold list doesn't have anything from September. Hovering more around the $350 - $400 range if I'm not mistaken. I'm surprised it's not more. Uncharted Fortune Hunter is 200 copies, but granted, wasn't sold. However, one single B&M location is pretty damn close. Add in Zelda (& Mario) and you'd think it'd be breaking $1k. The Smash Bros LE (which you know they're going to do) will probably fetch the most of the bunch. Shiny. I smell the top 5 of most sought after Wii U game in 10 years. BTW there was only, at most, 500 of these in the US. Nintendo fans are raging they missed out.